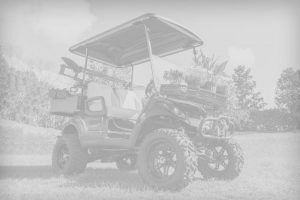 Kennesaw, GA – (January 2018) – Yamaha Golf-Car Company today unveils the newest generation of its hard-working golf utility vehicles with the technically advanced UMAX product line taking center stage at the PGA Show Demo Day and then in Booth #2243 at the Orange County Convention Center. UMAX features a larger and quieter gas engine or a powerful AC electric engine, plus smoother suspension, larger cargo bed, luxurious bucket seats and added storage spaces. The UMAX product line signals an evolution in the styling of a golf utility vehicle, moving away from the look of a golf car to more of an all-terrain vehicle. The more rugged look complements the actual increase in durability and longevity of the vehicle gained by replacing plastic body panels with extruded aluminum. UMAX also offers a larger cargo bed (33” long x 46” wide) bearing loads up to 1,000 pounds. Additionally, UMAX features a side-filled fuel tank, a first for Yamaha utility vehicles. 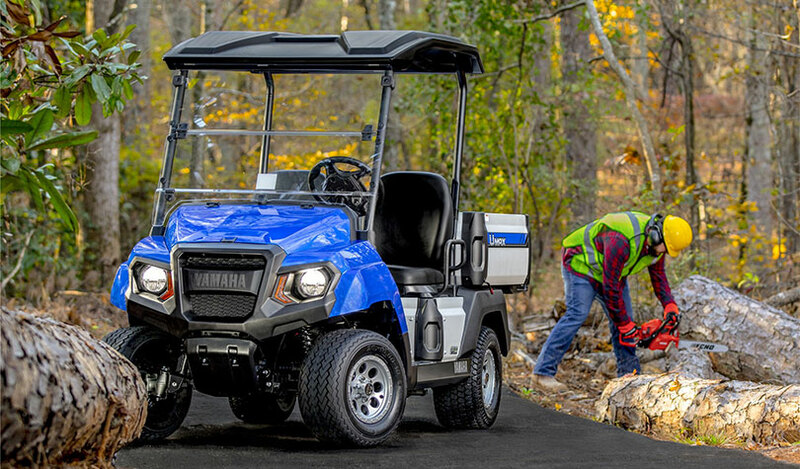 The gas-powered UMAX utility vehicle boasts a 12% larger, 402cc engine with some noise suppression features derived from Yamaha’s new Drive2 gas golf car. The sound dampening now makes maintenance vehicles and beverage car units approaching golfers barely audible from as close as 80 yards. The UMAX gas vehicle features Yamaha’s signature electronic fuel injection system (EFI), which offers smoother, more responsive acceleration and the industry’s smallest carbon footprint. The UMAX electric vehicle features Yamaha’s new alternating current-powered (AC) engine, which reduces battery amp hour usage and dramatically increases torque to better climb hills and travel faster and farther. Traditionally, the rear suspension system on a utility vehicle has been designed to provide the smoothest ride when there is a heavy load in the cargo bed, making the ride uncomfortably stiff under regular driving conditions. But, UMAX features a progressive rear suspension system derived from Yamaha’s acclaimed off-road vehicle division that features individual coil springs with dual compressions, or two distinct coil spacings on a single spring; a standard spacing on the top of the coil spring for lighter travel, and a tighter coil spacing on the bottom for transporting heavy loads. The result is a smooth ride and enhanced handling under any conditions. The traditional bench seat has been replaced, as the UMAX utility vehicle takes a page from Yamaha’s Viking Side-by-Side (two forward passengers) off-road vehicle by adding two luxurious front bucket seats. UMAX has answered the prayers of many a course superintendent by adding a spacious under-hood storage compartment that opens like an automobile hood and is sealed to keep water out. There are also two restyled in-dash storage pockets with anti-slip rubber mats, an added storage area near the cup holders, and new storage space between the seats, just perfect for a cell phone or tablet. The Yamaha UMAX utility vehicle features a single, center tailgate latch that you can operate with one hand. And an easily accessible latch behind the front seats releases the cargo bed. The vehicle also comes with new LED headlights for a vivid white beam and broader light coverage. A high-beam accessory is available as an option. Finally, the accelerator and brake pedals have a molded rubber cover for added comfort. One of the superintendent’s biggest challenges is keeping track of maintenance vehicles and golf play across over 100 acres of land. All that and more can be achieved with the option of Yamaha’s innovative YamaTrack GPS Utility. 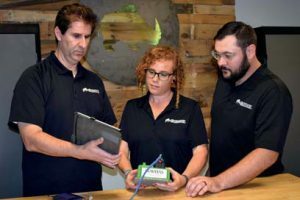 YamaTrack syncs to a computer or tablet and can track the location of all utility vehicles, maintenance equipment and golf cars. YamaTrack can even create an on-course geofence to establish a virtual perimeter around sensitive environmental areas, rain-soaked turf, green surrounds and the like.